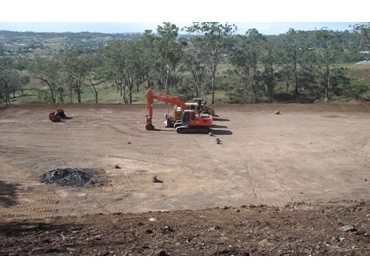 The company recently completed a host of earthmoving services for a project in Mt Rascal, Qld, involving the conversion of a flat block to 40 degree slopes. In this case, the roadway had to be cut and widen to 4m for 1km at 25% incline to elevation of 50 metres (including spread and compact gravel, create batters and stone barriers, drainage (with pipes) and open main entrance. Tracks were accessed along fence lines and the quarry prepared (including mixing of gravel for earthworks). The terrain was laser levelled and the compact shed and house pad soil compacted. Finally, a selective clearing of rocks was necessary and so was the reseeding of the area.